Go to our registration page for your chance to win! Live Arena Events would like to thank everyone who came out to the show and to all the performers it was a complete success! Stay tuned for future shows! 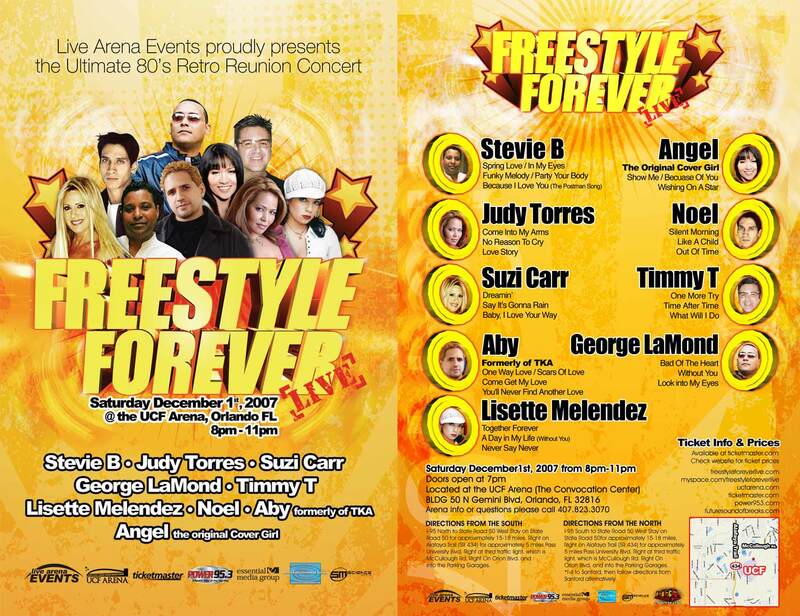 Live Arena Events presents Freestyle Forever Live - the largest Freestylemusic event ever presented in the Southeast and the first ever Freestyle event to be held at Orlando's impressive new UCF Arena. An exclusive lineup of Freestyle's biggest artists are slated to perform including the undisputed Godfather of Freestyle - Stevie B " Spring Love", "Because I Love You (The Postman Song)", Suzi Carr, former lead singer of Will To Power whose incredible voice spurred 4 #1 hits including "Baby I Love Your Way", "Dreaming'", "Say It's Gonna Rain", Aby, the former lead singer of TKA "One Way Love'", "Louder Than Love" the irrepressible Freestyle hit-maker Noel "Silent Morning", "Out Of Time", one of Freestyle's most acclaimed and enduring acts, often referred to as the "Queen of Freestyle" - Judy Torres "Come Into My Arms", "Please Stay Tonight", "Love Story" and that's not all - also scheduled to appear are George LaMond "Bad Of The Heart", "Look Into My Eyes", Timmy T "One More Try" and many more top Freestyle icons - 9 great artists - an amazing value for one low ticket price. As an added attraction, Top DJs will be spinning the hits between acts to keep the vibe going strong and exclusive merchandise will be made available for concert-goers including limited edition CDs, T-shirts and memorabilia. So come reminisce on 80's culture and relive an incredible era in the history of dance music at the hottest vacation spot in Florida. An incredible experience is guaranteed for all. service, posh seating, and exceptional hospitality. huge video walls fill the main room with massive energy. The first ever Freestyle event to be held at Orlando's impressive new UCF Arena. The UCF Arena (also known as the UCF Convocation Center and New UCF Arena) is a multi-purpose complex on the University of Central Florida campus in Orlando, Florida. It is the home to the UCF Knights men's and women's Basketball and Volleyball teams. It also hosts commencements, concerts, and many other events. Our Myspace Page is up! Click below to add us and keep up to date with exclusive goodies. This text will be replaced by the flash commercial player.